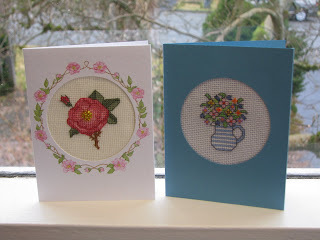 I made these cards as part of a birthday floss exchange for an online needlework group I’m in. Now that they’re safely in the hands of the recipients, I can post the picture. The recipients weren’t bothered by this at all, but I was. If the tables were turned, I wouldn’t have minded a bit. I love late birthday presents! But because I was the one who was late, I felt guilty (and I’ve participated in enough online groups to know how people who don’t follow through are viewed. I wanted to shout, “I’m not a flake! Really!”). The next birthday in the group is mine. It’s not for months and I don’t have to worry about ordering something for myself (although I guess I could, couldn’t I?). Still, I’m going to get everything ready for the rest of the recipients before then so I don’t have to worry about it. And so nobody thinks I’m a flake. I happen to know from experience that you are not a flake. And belated birthday cards? Well, better late than pregnant! When is that birthday of yours, Ms. S? Also, thank you for the wonderful postcard AND the note AND for all your kind comments on my blog that make my day! You are a wonderful friend! :-) Sending much love your way!